The menu is the first thing that customers ask for the moment they sit down in your restaurant. It holds the list of the food, the beverages, and the specials that you offer, along with the corresponding prices. 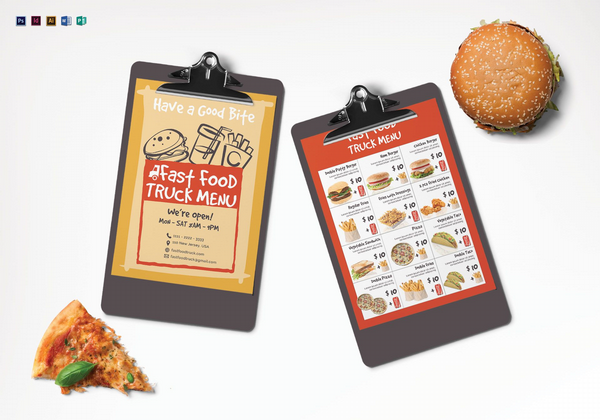 This is the reason why your menu must be well-organized and visually appealing. This is the easy part. If you run an Italian restaurant, your menu should mirror your theme. It becomes visually unappealing when your menu and restaurant theme is out of synchronicity. It also confuses customers and they may decide to have their meal elsewhere. Avoid this confusion by staying in theme. Correctly organize your menu. Make sure that it is easy for everyone to follow. Organize the food and drinks, and have the corresponding prices next to them. Make sure that the images are well placed and the font sized are big enough to be read. Nothing is worse than a menu you cannot read when you are starving. Before we consume food, we see it. When food is plated properly, it becomes more appealing. Make sure to take pictures of the food and specials that you offer to tempt your customers in ordering them. This also shows your customers exactly what they are ordering. Remember, the better the image, the better the impression it gives your customers. You do not have to be too descriptive of what your restaurant offers. Give a brief description of the dish. Sometimes, the description along with the image is all that it takes to have customers ordering. Having a list of the main ingredients used will also help people know what to avoid in case they have allergies to certain ingredients. It is always a good idea to have test prints. This way, you see how the colors and images look before you have your menus printed. Depending on the material the menu is printed on, color shades may change slightly. The same is true for images. Having test prints allow you to make the changes you need. This price menu is both efficient and effective. It makes efficient use of the available space on the food price menu template. This price menu template is downloadable in many file types like Microsoft Word, Photoshop, Adobe Illustrator, Publisher, and Pages for your editing convenience. This price menu is not only professionally made, but it is also very artistic. 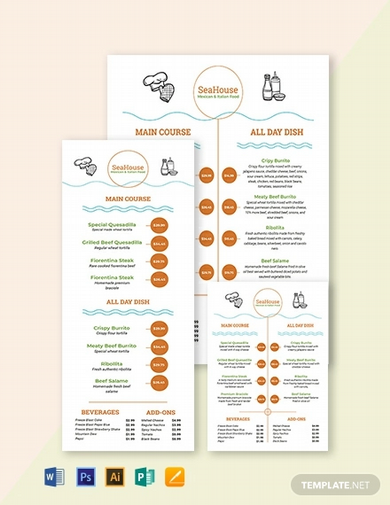 The eye-catching design is sure to get your customers flipping through your menu and order to their stomachs content. 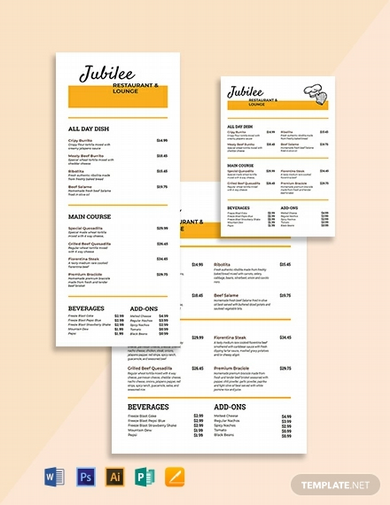 Take advantage of this price menu template and download now. Downloadable in multiple file types for your ease of editing. Make sure that the first thing that your customers see upon sitting down is your menu. You should also make sure that your menu is both be very well organized and visually appealing. This shows your customers the caliber of your service, food, and restaurant. 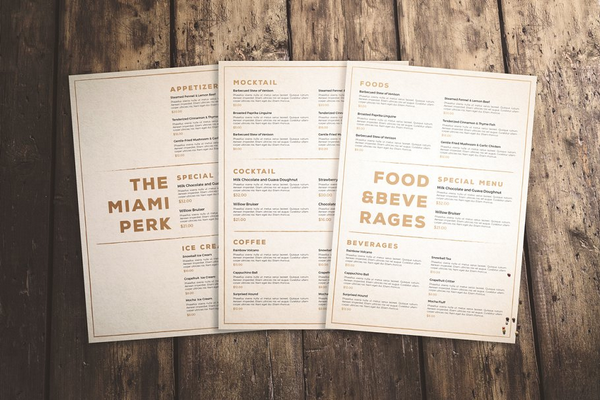 So make a good first impression with this professionally made price menu template. This fun and captivating menu is exactly what you need. Artfully designed to catch the attention of our customers. Download and customize to fit your exact needs. Available In Photoshop, InDesign, Adobe Illustrator, Microsoft Word, and Publisher for your editing convenience. So what are you waiting for? Get this template now and enjoy. Simple and elegant are the first words that come into mind when you first see this price menu. This template is professionally designed to make use of the available space and make it look elegant. Download and edit to suit your own theme. So get this template now, and enjoy. 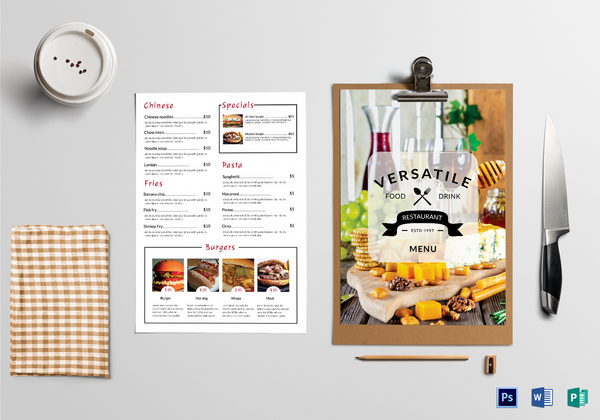 Stylish and tastefully made, this template is exactly what your restaurant needs. Use this restaurant menu price list any way you want. It is also very customizable. Simply download in one of the available file types such as Microsoft Word, Publisher, and Pages. Simply download, edit, and print! It is easy as pie. As stated, this menu boasts a clean, yet classic look. 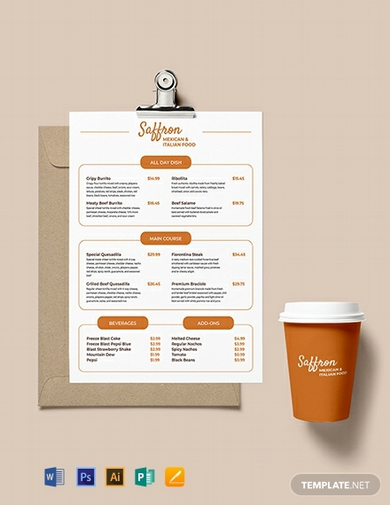 This price menu template is well organized and easy to follow. 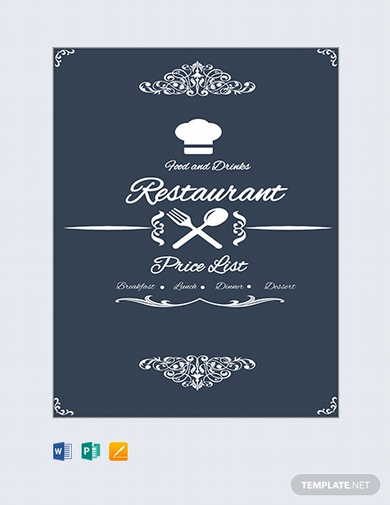 It has enough space for you to provide a brief description of the food you and your restaurant offers. Simply download this template and swap out the details with what you need.